The 2018 Canada Sevens Rugby Tournament at BC Place on March 11, 2018 in Vancouver, Canada. TAG Heuer Ambassador Chris Hemsworth leads the TAG Heuer countdown before the final match at the 2018 Canada Sevens Rugby Tournament in Vancouver. 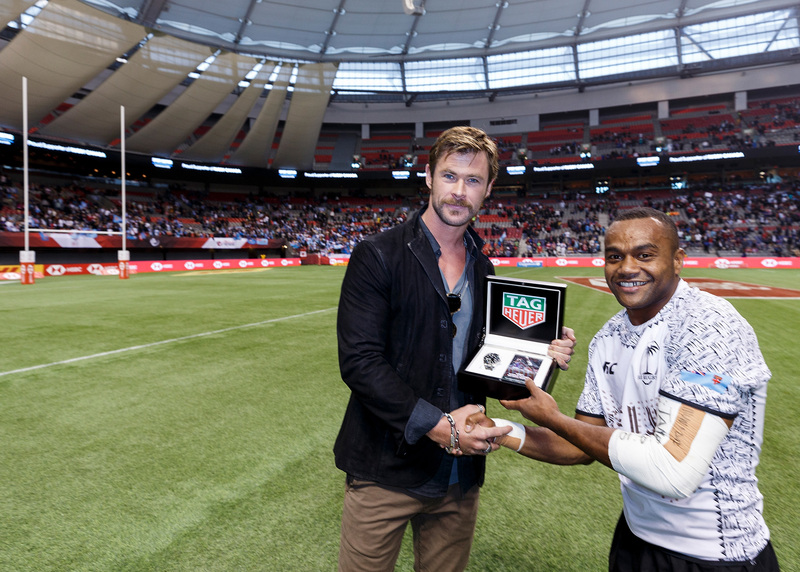 Chris Hemsworth presents Tag Heuer’s Aquaracer watch to Alasio Sovita Naduva of Fiji. 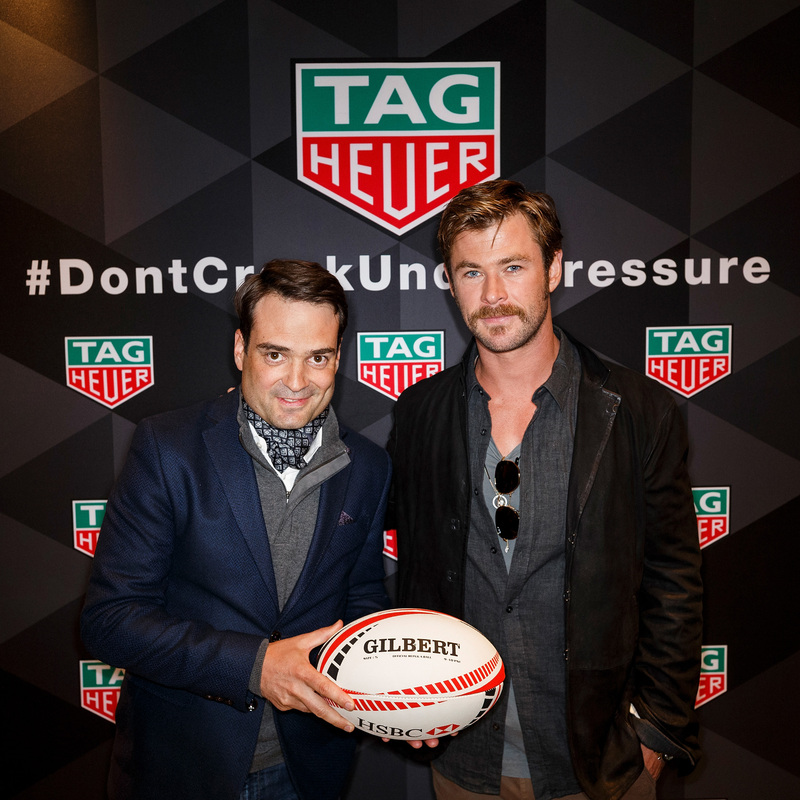 TAG Heuer President North America Kilian Muller and TAG Heuer Ambassador Chris Hemsworth. The HSBC World Rugby Sevens might be the only occasion where stadiums around the world fill with raucous rows of Care Bears and Mounties, the Simpson family and striped Waldos. These spectators, costumed in the Rugby Sevens tradition of “fancy dress”, cheer on as international teams rack up points in 10 tournaments around the world, leading to an overall winner to be crowned at the final games in Paris this June. The fervour of these condensed matches is palpable, as teams reduced to seven players scurry and tumble across the field in time crunches of seven-minute halves. 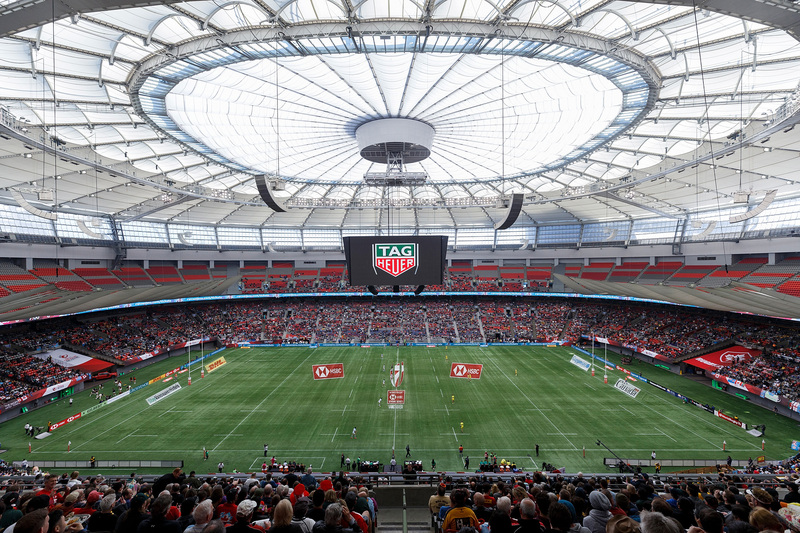 It’s especially fitting, then, when TAG Heuer’s phrase “#DontCrackUnderPressure” flashed across the screens in Vancouver’s BC Place, host of the season’s sixth round. 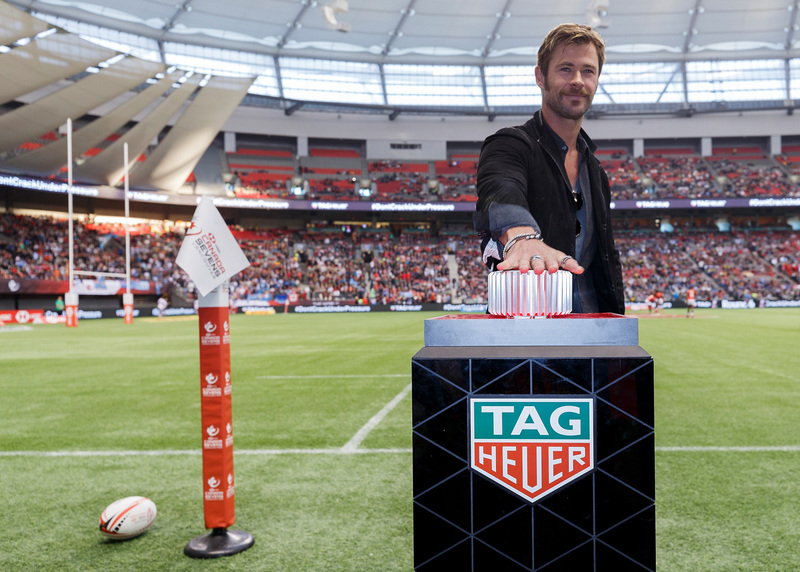 As the series’ official timekeeper, TAG Heuer continued its honour in Vancouver as the crowd welcomed brand ambassador, Australian actor Chris Hemsworth (known for roles such as Thor and Formula 1 racer James Hunt), to lead the stadium in a countdown to the final match of the Canadian leg. On the turf, Fiji and Kenya took their places. Overhead, the jumbotron ticked down to zero. The pressure was on. Owning that nervous energy is something every athlete must also overcome, with all eyes on them. The final game culminated in a thrilling victory for Fiji, with a standout performance from Alasio Sovita Naduva. In recognition of Naduva’s strength and agility, Hemsworth personally awarded the Fijian player with TAG Heuer’s Aquaracer watch. Photos by Andrew Chin/Getty Images for TAG Heuer.